Lance is right. Effective calls to action encouraging contact must be easy for prospective clients to find and use. A call to action (CTA) is any section on a website that inspires a visitor to do something. Your CTA should be short, simple, and action-oriented. It should be on each page of your website. It can be a button, text, or a combination of the two. 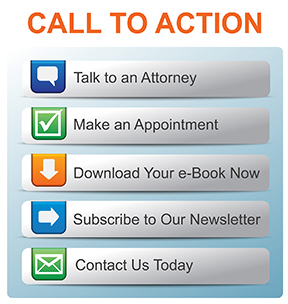 The most common CTAs on an attorney’s website are invitations to call, click to chat, schedule an appointment, or download an e-book. Studies show using pronouns like “your” or “my” is personal and more effective in convincing people to act. Test each word to see which works best with your audience. Try different words for consultation, case evaluation, or appointment. Those words sound too formal and are too overwhelming for some potential clients who simply want to ask questions. Try phrases such as, “We can help,” “Talk to an attorney,” or “Call us” added to your link to call or complete a contact form. Test to see which terms your readers prefer. Offer various methods of contact. Some people like to call; your phone number should be on every page. Others prefer e-mail, meet face-to-face by using Zeekbeek’s appointment scheduling feature, or use live chat if you offer that feature. Make sure these options are easy to find. Speak to your visitors. CTAs should engage your audience. Use active words. Your appointment scheduler can say, “Make an appointment in less than a minute.” Or “It’s easy and takes 40 seconds.” Tell them when they will hear from you and what to expect during that first meeting. While these suggestions can help, experiment to determine which words, placements, and buttons work best for you. Calls to action are some of the most important language on your web page. Using few words and indicating a minimal time commitment will encourage visitors to act. They can’t be an afterthought. Take time to produce the best CTAs for your firm. Roberta Gubbins has served as the editor of the Ingham County Legal News. Since leaving the paper, she provides services as a ghostwriter editing articles, blogs, and e-blasts for lawyers and law firms. She is the editor of The Mentor, SBM Master Lawyers Section newsletter.